Pronounced “broos-ketta”, this communal snack is one of best examples of doing the simple things properly to create a magical culinary experience. In essence, fresh extra virgin olive oil, vine ripened tomatoes, crunchy sea salt on still warm chargrilled, chewy bread can display to your guests as much skill, knowledge and care as preparing any award winning restaurant meal. In fact, I seem to recall a famous 2 star Italian restaurant charging a small fortune for an entree of the above, claiming that no other version came close… A bit like Cicero famously drawing the perfect circle to display his ability as a gifted artist. 20 years ago we constructed a 40 x 8 metre poly tunnel here in freezing Bowral, purely to grow the most outstanding tomato I have ever tasted. Each year since, having collected and grown the seeds from the previous seasons best tomatoes, our family ritualistically sits down to the first bruschetta. Nothing better! 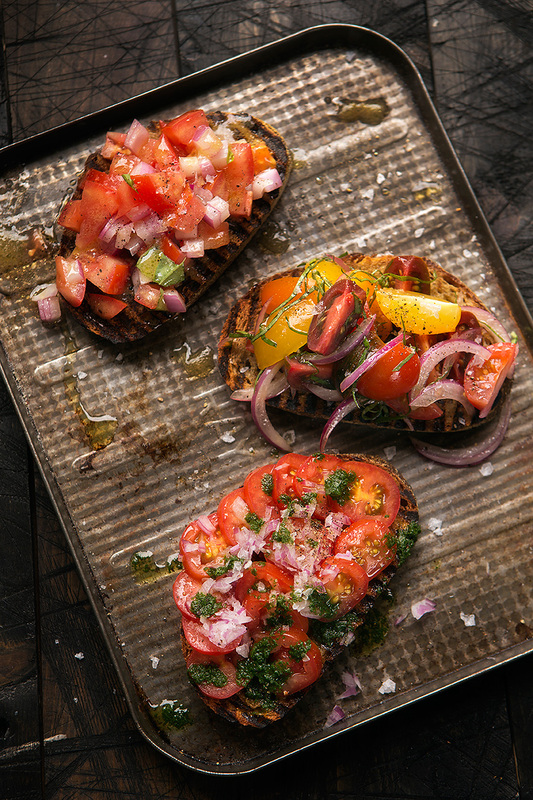 You probably know that there are many versions of bruschetta, each thought of as the only real way it should be done. We Janszes certainly have our favourite, never to be strayed from, version, however, here are a few suggestions for you to play with and hopefully create your own “only way to have” bruschetta. I really must stress, no quantities can be given here. There is absolutely no way of knowing the strength of the vinegar you will use, let alone how acidic you like your food, and importantly the nature of your other ingredients that the vinegar needs to balance. The following is a list of steps, procedures or techniques, by no means comprehensive. Each will have an intrinsic quality that you may prefer and incorporate. Chewy, day old, crusty bread is great, but only serve this if your guests have a plate of their own… The holes result in a lot of leakage! For non-leaking Bruschetta, buy a ciabatta loaf. It’s long and flat and when split lengthways through the middle (to make two hot dog like “subs”) you can have a crusty base, which holds the juices. I toast my bread on a grill. A searing hot grill produces very charred spots, with a crunchy exterior and a warm, chewy centre when toasted briefly. Slower, longer cooking of the bread will result in a crisp, non-chewy cruton. Rubbing a cut clove of garlic straight onto the hot side of the grilled bread results in a distinct, cooked garlic bread aroma, but only if the bread is hot. Otherwise, you will have a raw garlic flavor. Choose distinct, flavourful oil; it is part of the flavour profile of the dish. Green, grassy and young is more itialian in nature, while the Spanish prefer buttery, fragrant and soft. Pouring the extra virgin olive oil directly onto the hot toast will release the aromas and flavours of the oil. Adding a pinch of salt to the warmed oil also releases the flavours of the oil. Must be naturally, full flavoured (there’s enough written about vine ripened, locally grown, sustainable etc… tomateoes for everyone to make their own choice here). 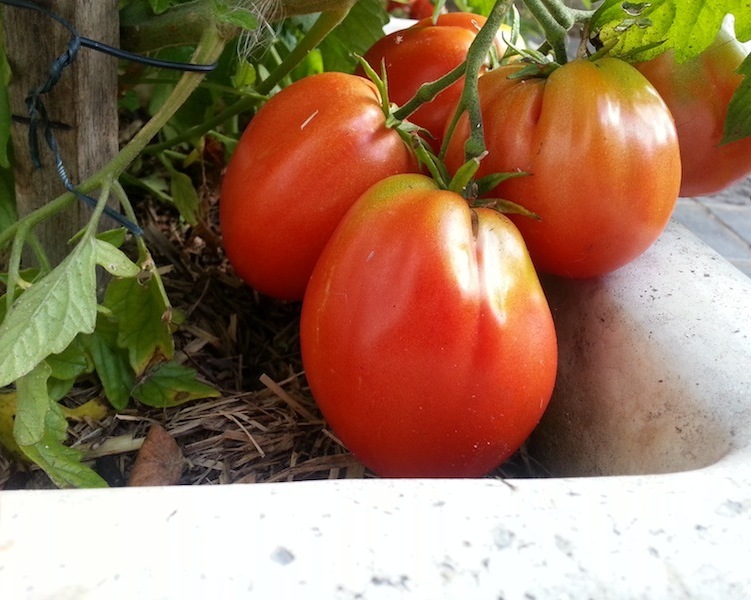 Skinned and de-seeded tomes flesh (concasse) lends an elegant, dinner party feel to the bruschetta, although I prefer the natural, rustic nature to just chopped fresh tomatoes. Mixed colours of heirloom varieties look great. Add 1/3 of your total salt into the bruschetta mix, and sprinkle the rest onto the top for crunchy little burst. Here is a list of my success stories over the years. Please don’t mix ALL of them together! In the spirit of what I’ve said above, the Jansz family’s favourite bruschetta mix includes extra virgin olive oil, Dijon mustard, red wine vinegar, salt, pepper, and basil and tomatoes picked fresh from the garden.